One day Jesus took me to a lush green field full of flowers in my quiet time. they were so large, and beautiful. He cradled a yellow one in His hand and said, "the flowers never die here..."
I looked at the grass...and it was so alive, it was moving like it was under water. There were no dead or damaged areas on any of the blades. I started thinking, meditating about how we, His children, are like flowers, we will never die now that we are His...and how Jesus prayed for us to bring heaven to earth... I even posted on my FB page "Heaven...where there’s no more death, no more disease, no more sorrow, no more sickness, no more hatred, and no more evil...let us bring heaven to earth!!!!" After that happened, I started seeing a yellow butterfly already painted on a canvas, but I didn't know what God was showing me. I kept asking Him, "what is it Lord?" I was telling my sister about it, trying to figure it out, and one flew by us. 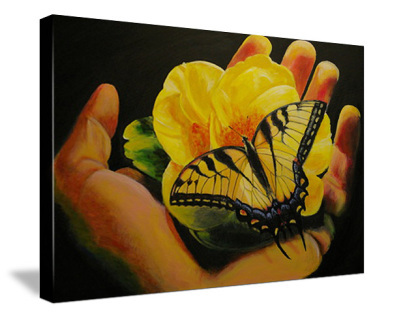 Yellow flower, yellow butterfly...I knew God was speaking. I kept hearing about Jonathan Helser's worship service in High Point, originally I had planned to be in Boston, MA so I knew I wouldn't be able to go. 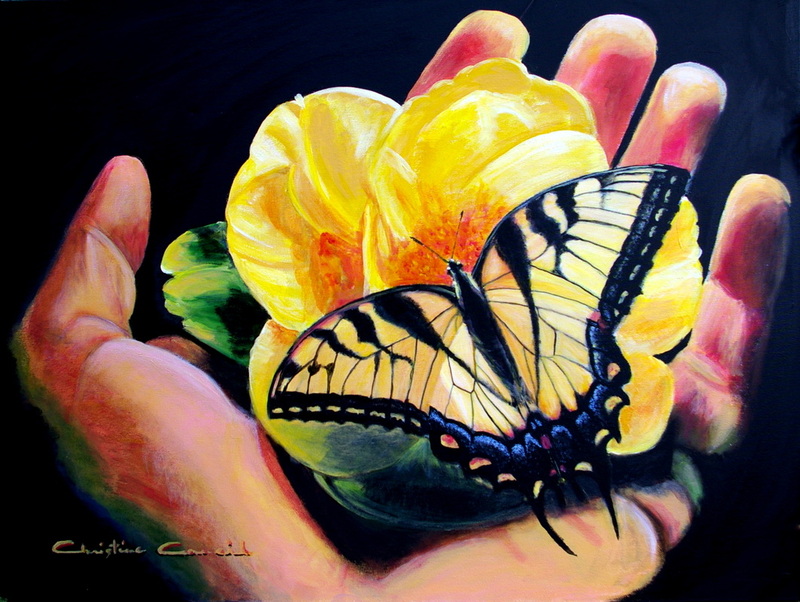 I ended up cancelling my plans, and right afterwards, someone else mentioned the Helser's service to me again...and it was the day before the event, and all of a sudden, it occurred to me that I was supposed to go and paint the butterfly, on the flower, in His hand. While driving to the meeting God confirmed it when a yellow butterfly, the very same one, flew right in front of my car I did not even know if they would let me paint, but I had a peace about it. I knew no matter what, I was going to release this painting...even if I had to paint it at my seat. But, when I got there, of course, they were fine with it...because they are free...and full of love. I had no idea Ken Helser, Jonathan's father, was going to be there. God used Ken as an encourager in my life. Although I had never met him, he had emailed me several times years ago and encouraged me to get up and paint that very first time. 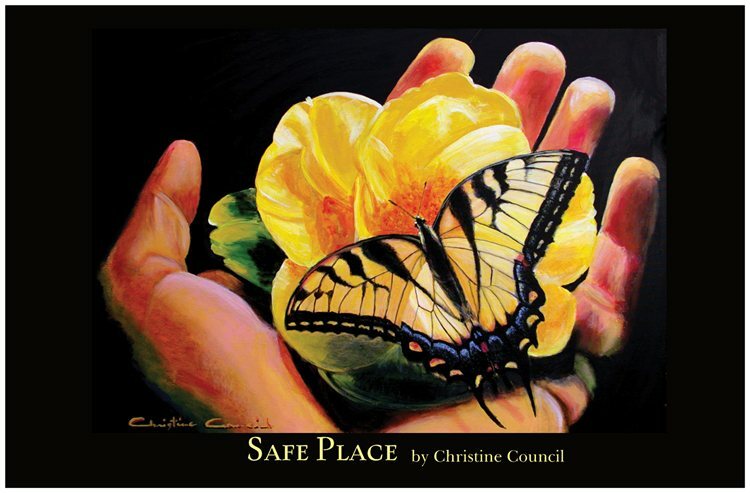 It was a testimony he recommended I hear about one of his paintings, a butterfly that was out of a mason jar, that got me to paint in the first place.http://www.christinecouncil.com/the-call--timeline.html It was the same butterfly that I had seen in the vision, and the same one that God has used repeatedly to encourage me to fly. Then, getting to hear his son sing while I painted was so amazing. God has used his music to minister to me so deeply...and encourage me to move forward in the Lord. The last song Jonathan sang was "God is Love," the very song the Lord gave me recently that helped me step off the edge and fly... During the worship set, Jonathan spoke about the Lord's Prayer, and how we are called to bring Heaven to Earth. During one of the breaks, 3 women came up to me, and said they felt so drawn to me. We got to talking and it turned out, they went to the VERY same church I had planned to be in that weekend in Boston! They said God had led them to that meeting, and that they now believed it was to meet me. How amazing? Children were so drawn to me as I painted, I had so many around me asking me questions, playing with my paintbrushes, making comments, encouraging me...sharing their heart... I was tempted to shoo them away, because I was "trying" to paint, but the Lord reminded me...."It is more important to love, than to paint something perfectly." 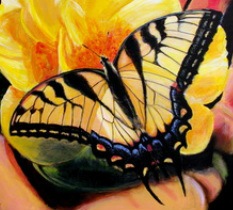 As I painted this, I knew that Ken and his grandson were battling cancer, that is why I HAD to paint it. I wept and prayed for them both as I painted. At the meeting a couple of months later, where I presented this to Ken, he told us his grandson had been healed. that JUST happens to be the son-in-law's sister, and little boy's aunt! Ken has also been healed of the cancer since then. Praise God!!!! 11" x 17" Print of "Safe Place"
4" x 6" Postcards of "Safe Place"
Quantity 50 Can have back custom printed.